Livestreams are great and all, but they're all subject to a terrible reality: the more people who want to watch, the more likely it is the stream goes down. BitTorrent's P2P streaming service BitTorrent Live stands to change all that by actually drawing strength from the crowd, and it's here to start shaking up the scene. 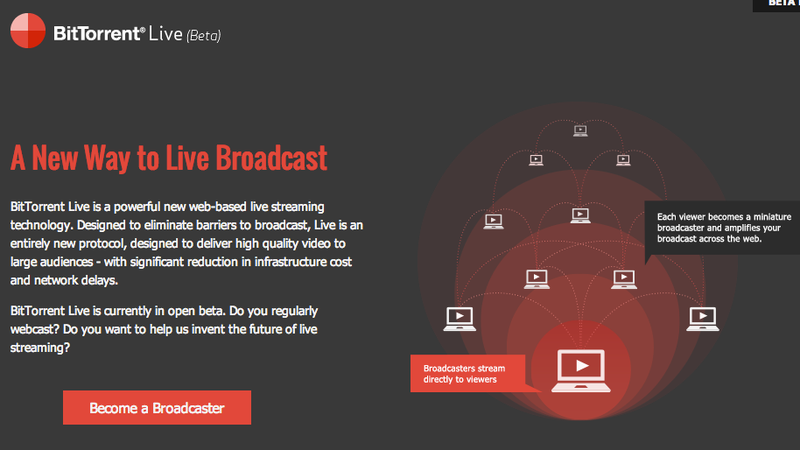 Developed on the on the foundation laid by the original BitTorrent protocol, BitTorrent Live chops up live video feeds and distributes the load among a bunch of peers much in the same way your standard torrent will divvy up a giant file. This cuts down on lag and latency and makes streaming live video wildly easier from a resource perspective, effectively removing any barrier to entry for broadcasting, especially when there are large audiences involved. BitTorrent Live has been under development and testing for years, culminating in a closed beta test that's been running since early last year. It's technically still in beta, but as of now it's open to everyone. You can go sign up to give it a try on the BitTorrent Live page. Let's hope it won't be long before we can say goodbye to crappy streams for good.